Telecommunications firms face shortages of skilled labour and a high demand for entry-level workers. Many of your employees handle sensitive personal information about your customers, while others have access to physical or intellectual property. The result is a complex workforce with particular background checking requirements. BackCheck serves the majority of Canada’s telecommunications providers, and has experience in designing customized packages suitable for the wide variety of positions within the industry. We have screened tens of thousands of individuals coming into the sector, and leverage that experience to continuously improve upon our processes and results. Multi-Site Implementation – ordering and reporting systems designed for the largest scale, allowing you easy but secure access to information at the local and national level. International Checks – many qualified candidates are coming from overseas. Read about our Global Solutions, which are chosen by many of our telecom customers. World-class Data Security and Software – provides you with security, reliability and ease of use. With all clients, we take a customized approach to packaging services ensuring we meet each of our clients’ screening needs. 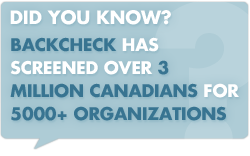 Contact BackCheck today to learn more about screening candidates.